Our picks for the best four sweet potato cutters. Attributes you should look for in a sweet potato cutter. What the pros and cons are of our top picks. 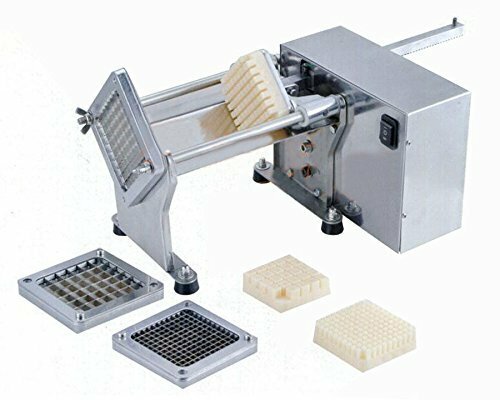 New Star Foodservice 43204 Commercial Grade French Fry Cutter: This fry cutter option has been on the market a long time and has been vetted by thousands of users. It’s stainless steel, comes with suction cups and has everything you need to get started right away. One note is that if you’re going to cut sweet potatoes, you should get the 1/2 inch screen on this unit. The other screens are way too thin for the job. 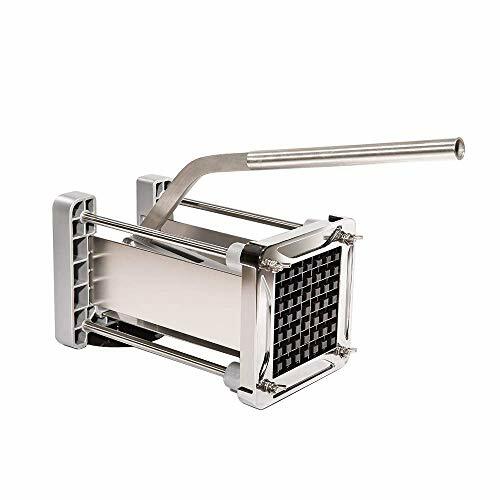 Sopito Stainless Steel Fry Cutter: This is a fairly new potato slicer option on the market which is light weight and comes out of the box with the 1/2 sweet potato blade.It’s well worth checking out. La Bai Electric Potato Slicer: While this is an off-brand fry cutter that’s fairly new, we thought we’d list it because it’s one of the few electric options that are affordable. It’s the only way that you’ll be able to cut sweet potatoes into fries your home without using elbow grease. Click any of the links above to check their current pricing. One important note is that even though the manufacturers of these cutters say that they are good for sweet potatoes, some sweet potatoes can be extremely dense (depending on each individual potato) and hard to push through the cutters even if it is super heavy duty. However, this can be negated rather easily by cutting the potatoes to the appropriate size before trying to get it through the blades. We'll touch on the best blade sizes (hint - it's 1/2") and some other tips throughout this guide. How Do these Potato Cutters Work? Using suction cups, the user secures the potato slicer to a table or other stable surface. The potato is then peeled and placed in the device against the blades. It can also be cut to a more manageable shape or size if it's too large. This makes it easier to push the potato through the fry cutter. The user then uses the lever (or the lever is pulled electronically) which forces the potato through the screened blades of the fry cutter. Viola! you've got french fries. The following video goes to show what you can expect from one of the more popular french fry cutters on the market. A regular knife can do a semi-decent job of cutting potatoes for french fries, but if you want to step it up a notch, you'll need a tool designed specifically for the job. 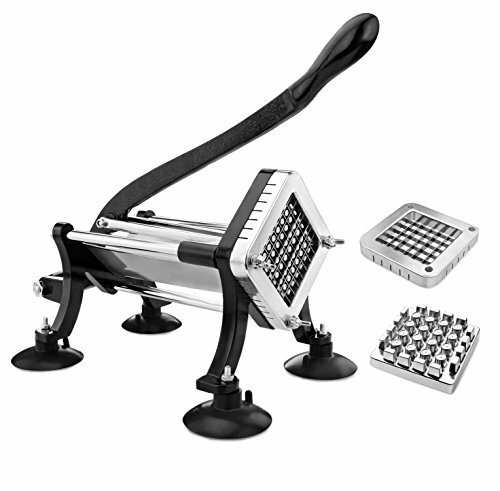 A high-end sweet potato slicer typically mount to a kitchen counter-top and give you the ability to push the potatoes right through. This eliminates the need for a knife and do the entire job of cutting fries in just one motion! Keep in mind that most units can be used interchangeably for sweet potato fries as well as white potatoes. If you're prepping for a large family, there's no better tool for prepping large amounts of potatoes. Even though we did a guide on how to cut them ​​into french fries, it can be downright exhausting to do for a large group of people. Also, not everyone has the knife skills to get things uniform an d let's face it. Uniform french fries taste the best and it's easiest to create them with a cutter designed for the job. The great part about the cutter options on this list is that they aren't limited to cutting french fries out of potatoes. There are so many other things that taste great when they're cut the same way including carrots, cucumbers, squash, zucchini, etc. When you look through all of the fry cutters on this list you'll notice that there are a few different blade sizes. For products such as the New Star fry cutter, you'll probably want to order the 1/2 inch blades. This is because it takes less force to cut when you have a larger screen size. If you're hoping to do teeny tiny sweet potato french fries with the small 1/4 inch blades, then you're probably not going to be able to unless you're super strong. But do keep in mind that the mandolin option might be a good choice. You'll be to do different shaped fries pretty easily, but they might be a different shape than the traditional small wedges. The advantage to a mandolin cutter slicer is that it's more versatile and affordable than a french fry cutter. It's good for doing all sorts of different shapes and can accommodate many fruits and vegetables. We've recently gone ahead and added an electric french fry slicer to this list. Why? Well, because cutting sweet potatoes into french fries manually is hard work. If you're not a strong individual, then you might find one of the manual units to be too hard to use. The bad news is that electric units tend to be more expensive. If you have to go with a manual one, some people like to place these units on the floor to get a little more leverage if cutting a really hard sweet potato. This way you can get your whole body into it rather than just using the strength of your arm. Although we have a plastic potato cutter slicer on this list, we don't recommend it for the application here. Plastic is simply too flimsy when you're dealing with tough and large potatoes. It's a decent option if you want to just deal with regular whites, but won't perform so greatly when it comes to turning a thick yam into a french fry. How Did You Pick These Best French Fry Cutter for Sweet Potatoes? To give you the top options at home you can use for sweet potatoes fries. Have some alternatives to traditional potato fry cutters for higher or lower budgets. Present you with some creative and different fry cutters and slicers that you may not have thought of for this specific application. We've already given our recommendations at the top (and in the conclusion), so these aren't in any particular order. This is a new product to the market that's mostly stainless steel and super heavy duty. Much like the other models such as the New Star, the user must use the lever to push the potatoes through the screen. Luckily, it was designed with sweet potatoes in mind. Thanks to the 1/2" blades that come standard on this gadget, you don't have to worry about ordering a different set of blades. the blades that it comes with are specifically meant to handle fibrous root vegetables such as yams and carrots. It also comes with a suction cup like all of the bigger brands to help keep it in place while you're working. Comes right out of the box with 1/2 blade ready to cut sweet potatoes into french fries. It's lightweight at 4.4 lbs. Made of all stainless steel so you don't have to worry about cheap and flimsy plastic. Suction cup hold the fry cutter place while the user pulls the lever. Helps potatoes not slip out while cutting. Still not as easy as electric french cry cutters for the application. Will require the user to be strong. Most of the time, it's impossible to afford an electric model like this one. You only see them on restaurant sites and they cost thousands of dollars. Granted, they look really awesome, but it's unrealistic to have one inside your home for cutting potatoes. This is a new model to the market, but it's not from a name brand that you'd recognize. However, it's far more affordable than commercial french fry cutters. So far, it's been well-received so we thought we'd add it to this list as an alternative for someone that isn't strong enough to use a manual cutter. Let's face it, getting hard potatoes through the cutter blades isn't always so easy. An affordable version of an electric potato cutter, no manual effort required to cut good fries! Comes with 3 different sized screens: 6mm, 10mm, and 13mm. In inches, the 13mm is the half inch size that's ideal for sweet potato fries. More accessible to the home user than the restaurant versions which cost thousands of dollars. Not very many reviews to speak of online of this fry cutter. No brand reputation. Need to exercise caution because it's inherently less safe than a manual cutter. As the name implies, this is a commercial grade fry cutter. However, with its sleek black and silver exterior, its perfectly suitable to be displayed in any modern kitchen. Since it can be mounted on a wall or a table, it gives you a lot of flexibility on where it will look and perform the best. You have the option of a temporary mount with suction cups, or a permanent mount if you're using it in a more commercial setting. Unlike cheap and flimsy home models of fry cutters, its made of cast iron, stainless steel and aluminium. As a bonus, it comes with both 1/2" and 3/8" blades. The thicker the cut, the easier its going to be to get a dense potato through, so having the 1/2" option is really nice to have. ​ The company also manufacture's more accessories which include more blade sizes offering even more flexibility in the future should you so choose. It weighs in at 12 lbs and measures ​in at 20.5 x 10.5 x 9.7 inches. This may be bulky and heavy for some users. Multiple blade sizing options for cutting available - comes standard with 2. Option to permanently or temporarily mount with suction cups so that a potato won't slip around when you cut. Made of strong cast iron, stainless steel, and aluminum. Suction cups to hold it down while you're cutting. Slicer may be heavy and bulky for the some users at 12 lbs. and has suction which allows to to mount. This gives the user a high amount of balance, leverage, and power to make cutting even the toughest sweet potatoes easy - ideally if the ends are cut off giving you even more leverage. Keep in mind that although this cutter is powerful, it is heavy and rather large. The entire thing weighs 15 pounds and is 14" x 10.5". Another downside that we could find was that the cutter blade only comes in 1 size which is 1/2". Perhaps the manufacturer has released another size, but we haven't been able to locate it. Great for doing a large amount of potatoes. Powerful suction cup mounting for sturdiness. May be bit and heavy for some users. Only one blade size option that we could find (1/2"). This is good for sweet potatoes but no variety if you want something else. Although a mandoline slicer isn't completely designed for fry cutting, we thought it would be good to consider for someone who wanted a more versatile option. Not only can mandolines cut thin slices of sweet potatoes, but they cut pretty much any other vegetable as well. 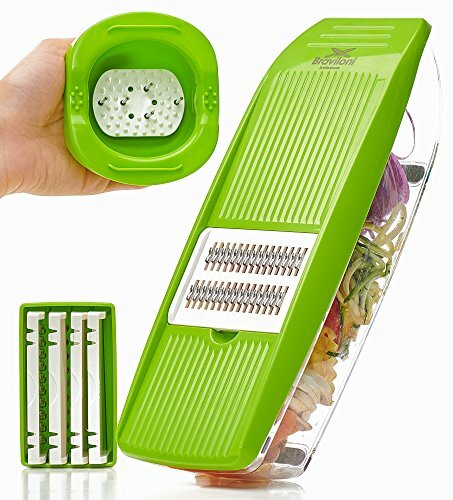 In addition, this particular mandoline can also work as a grater or julienne slicer. Cutting vegetables in this fashion makes them a lot more palatable and versatile. If you don't have your mind completely set on doing traditional stick french fries, this is worth checking out! It also helps with cutting onions from reducing some of the irritating gasses. You may also want to check out our post on vegetable choppers, cutters, and dicers to see some similar models. Comes with two blades to easily adjust thickness. Won't do the traditional "french fry cut". Not going to be as time efficient as the other units on this list. 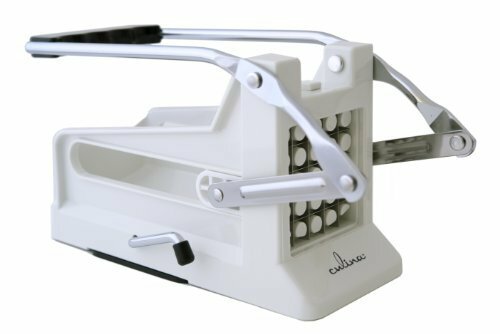 The Culina can be considered the least heavy duty fry cutter on the list. It's great for the user that's looking for something simple and easy to store. It also comes with two blade sizes so you can adjust the thickness of the french fries you're going to make quickly and easily. The downside of this model is that its a bit on the small side and not nearly as powerful as the others. This means that sweet potatoes are going to be a bit tough with this cutter. That is not to say that its impossible, though especially if properly softened, but we really don't recommend getting it for that application. ​We wanted to include this option for the user who was going to stick mostly to regular potatoes or couldn't justify keeping one of the bigger heavy duty models in their house/apartment, but if you're going to be doing sweet potatoes in bulk you're better off with one of the others. Simple & small making it easy to store. Ideal for regular white potatoes. Not as powerful as the other units. May be too small for some potatoes (even white ones). Depending on the density of the sweet potato, it may not have the power to easily cut them. Although this is almost a vintage device, we still thought it was worth including it on this list because you can still find it available for sale. It's sort of like a spiralizer, but it's designed specifically for potatoes. Rather than making regular fries it allows you to make curly fries! The fries come out super thick, much like a fast food restaurant. The only difference is you don't have to load it up with grease and oil, you can make them guilty-free right in your own kitchen. 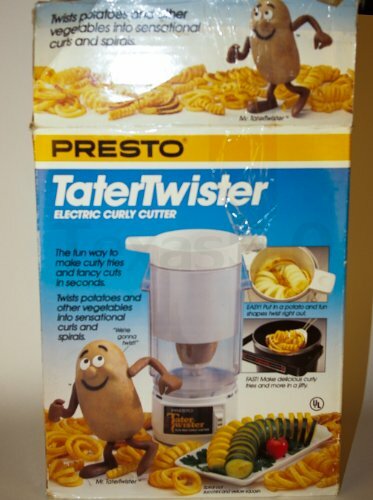 The Tater Twister probably isn't the best for sweet potatoes, but it's a product that's worth having a look at. Oh and let's not forget to mention that it's electric. You still have to push the potatoes down onto the blades, but the blades spin from the motor. For those of us who aren't that strong, it's much easier than using a regular fry cutter. One of the original spiralizers that actually works on potatoes. It's electric and doesn't require much manual labor. Comes with different blade types that can be used including scalloped potatoes! Not easy to do potatoes in bulk. 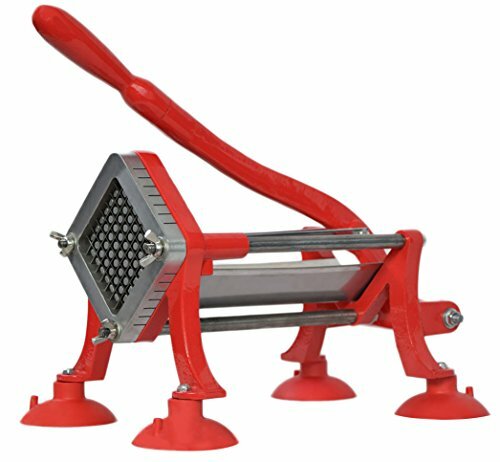 For most people, the New Star fry cutter is probably going to be the natural option since it’s a trusted brand and product that’s been on the market for a long time. And of course, because it can handle sweet potatoes with the correct blade option. Overall, it’s the one we’d recommend the most for this application. Depending on your budget, the Sopito french fry slicer might be an option to check out and price compare against the New Star. And of course, if you’re feeling bold and want the capability to do things like a commercial kitchen, theLa Bai electric option is worth considering to cut french fries in bulk in your home.